The Bubble Factory is our homemade bubble blower, kids love this craft! 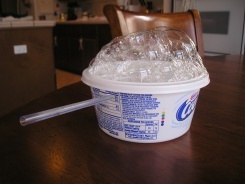 All you need is an old margarine tub, straw, hole punch and dish soap and you've got instant summer fun! You will need to make sure the child doing this craft knows how to blow into a straw and will not drink the soapy water (yuk!). Older tolders will love this craft, if an adult punches the holes for them, they will have lots of fun! 1. With your hole punch, punch a hole in the lid of the magarine container. Punch it any where, as long as the hole is past the lip of lid it will work. 2. With your hole punch, punch a hole in the magarine container. The hole needs to be punched near the top, otherwise your "bubble juice" will leak out when you fill it. 3. Now you're ready to blow some bubbles! Pour in some dish soap and water into your tub. Insert the straw, flexible end first, into the hole on the side of the tub. Aim the straw down to the bottom of the tub. Put the lid on the container, with the hole in the lid opposite the hole in the tub. 4. And finally, blow! Instant summer fun! You can always decorate your bubble factory with stickers or by gluing on decorations. However, this is not recommended since the soapy water may damage these embelishments! Permanent marker may be the only safe alternative!